In Strategy Shift, my colleague, C. Brooke Dobni Ph.D. with co-author Christopher Sand, Ph.D. assert that organizations that want to be innovative need a strategy shift. To innovate and pivot quickly, firms must continually nurture their culture to innovate and adapt and evolve with their ever-evolving business context. Human Resources leaders have a role at the table in this process working with executives to nurture the agile, collaborative, and transparent cultures of innovation required for this Strategy Shift. This blog is based on the academic paper, “Strategy shift: Integrating strategy and the firm’s capability to innovate,” by C. Brooke Dobni, PhD, and Christopher Sand, PhD., published in Business Horizons (2018) 61, pp. 797-808, and is available at https://doi.org/10.1016/j.bushor.2018.06.002. Organizations around the world are facing ever-changing customer preferences, generational shifts, the need to digitize their operations, and disruptions from well-funded start-ups outside of their domains. In our experience consulting with firms, we have learned two certainties related to innovation and strategy. The first is that organizations are not prepared to abandon their current strategy frameworks for something that may be disruptive. Instead, they tend to work around the edges of innovation. Executives implement best practices while leaving their core positioning intact. Strategy disruption is simply not in their DNA, as most managers do not understand disruption and are fearful of what they do not know. Our second observation is that innovation does not work well as a stand-alone initiative. It needs a reason to exist. Strategy is the vehicle for innovation to exist. Therein lies the contradiction as most leaders view innovation as risky. Yet by not pursuing meaningful innovation they are putting the firm at greater competitive risk. Organizations that want to be innovative need a strategy shift. Simply put, this disruption requires an organization to spend less time on the basic strategy practices in favor of more time considering what no longer provides sufficient value and what might generate transformative value in the medium to longer term. This strategy shift is shaped and supported through leadership that embeds innovation into the organization’s fabric. This shift needs to engender new strategy. The tenets of which include the capacity to generate and test new ideas, the ability to pivot quickly, and the freedom to fail without recourse. Guided by our research on innovation and strategy from over 1,500 global leaders we have uncovered three obstacles to innovation. There are distinct differences between innovation and strategy. Innovation can be either exploitative, that is dealing with the enhancement of current methods, products, and services, or explorative, dealing with largely unpredictable and unprecedented propositions in which market needs are speculative. Innovation is the way employees think about opportunities and threats to the firm. An innovation culture produces mavericks while, on the other hand, the strategy process often rewards the bureaucracy-inclined given its focus on history, planning, and control. Strategy involves budgets, schedules, time frames and cycles, and hierarchies that lead to desired outcomes. These lockstep practices are the very things that stifle and even run counter to innovation. Strategy formulation is analytical and intuitive, often forcing organizations to forecast the future based on the past. These configurations are often easy for competitors to decode and copy. Innovation works quite differently: organizations define a desirable future state (while not trying to predict it) and then work toward it—regardless of the corporate history. Innovation is best when not bound by a schedule, monopolized by a few, or corralled by boundaries, structure, and rules. Although innovation has strategic direction, budgets, target milestones, and measures, it is constantly evolving as the firm learns from its success and failures and its relevance to the needs of customers. The capability to innovate is very difficult for a competitor to imitate. In short, if both sides of the innovation and strategy coin are not properly understood and aligned, an organization’s capability to innovate becomes increasingly paralyzed by limitations. Without alignment, executes often communicating what is not possible instead of removing the obstacles to make strategy happen through innovation with well-informed management in the role of the catalyst. Often, firms seeking innovation fail to introduce a context to support innovation. Introducing innovation as a strategic initiative with a budget line to be channeled through the strategy process is commonly met with failure. Fresh thinking will involve ditching stale practices in favor of generating dynamic ecosystems, technologies, and methodologies that will support nonlinear thinking. This will involve nurturing a context to support innovative behaviors and related actions of employees and external partners. Strategy shifting is the first step in breaking old habits to make room for fresh approaches. It clarifies the relationships between strategy and innovation and forces organizations to consider the types of outcome behaviors then need to support strategy. For example, having maverick employees who constantly come up with new ideas and solutions is a competitive differentiator and organizations need to support a culture needed to support creativity and independence on a consistent basis. Strategy shifting means spending as much or more time on eliminating strategy that no longer supports meaningful value creation as is spent on the generation of transformative strategy. We suggest a 10%–80%–10% initial approach. That is 10% eliminating or reducing old strategies and approaches, 80% on core strategy, and 10% on generating new strategies and innovation. Organizations will need to be comfortable with the pace of change, and as a result the allocations of time and resources could be more aggressive or less. Please see the chart to better understand the Strategy Shift Framework. Innovation Obstacle No. 2. Strategies are context specific, but the context is often constantly evolving. It has been said that change is the only constant thing. Companies face challenges from new technologies, customer preferences, fundamental shifts in product and service demand, and the supply chain. It is often the subjective perceptions (or unconscious biases) and interpretations of environmental conditions, however, that carry the most weight with strategy makers, whose perceptions of reality are influenced by their mental models and the culture of the firm. This fast-paced contextual change will become the organization’s greatest challenge in the next five to ten years. A 30-year review of the Boston Consulting Group Matrix shows that the share of profits from cash cows has decreased from 53% in 1982 to 40% in 2012 and continues to fall, while share of profits from stars increased from 6% to 22% over the same period. [ii] Markets are less predictable and the ability to pivot quickly from idea to market has never been more important. To pivot quickly, firms must continually nurture their culture to innovate and adapt and evolve with their ever-evolving business context. This requires understanding that firms possess tangible assets such as capital, technology, financial assets and intangible capabilities such as organizational routines, processes, and habits. Together they make up the organization’s unique stock of resources. To pivot quickly, firms must upgrade their assets regularly. Our research shows that the greatest of this is the intangible assets in employees. Across all our surveys of innovation culture of over 3,000 organizations globally (Dobni and Nelson, 2013; Assad et al., 2017), employee skills and creativity score the highest, while the perceived empowerment to act and processes to support this action score lowest. [iii] The desired behaviors are there, but they are capped by hierarchy, risk aversion, and a lack of empowerment. This paradox cripples’ dynamic capabilities as there is little incentive or context to support it, and in fact, no opportunity to fail in trying – as failure is often punished. Our results also indicate that this issue is magnified with larger organizations. This contradiction may prove to be the largest obstacle to a firm’s innovation, and it must be addressed accordingly. The business model and its eco-systems to move from ideation to successful implementation need to be well defined, adopted, and understood by all. The model we present is strong on process to support new ideas, to test them quickly and efficiently, and to execute them effectively. Innovation Obstacle No. 3. The belief that innovation is risky. While innovation is viewed as risky and lacking in short-term returns, yet growth is simply not possible without some degree of risk. Combine this truth with the organizational values that evolve around risk aversion and the favoring of short-term returns over the longer term, and we find another paradox. Similar to Innovation Obstacle No. 2 (when subjective perceptions, mental models, and organization culture get in the way of innovation), it is not the creativity of employees that need to be emphasized, put the process in place to harness and test ideas efficiently. In order to pivot quickly, this requires leaders to accept risk as a positive and to learn from failures as well as successes. One of the most famous pivots in social media history was the transformation of Odeo into Twitter. Odeo began as a network where people could find and subscribe to podcasts, but the founders feared the company’s demise when iTunes made a play in the podcast niche. The looming of this threat was turned into an opportunity when Odeo employees were empowered to come up with new ideas. After giving the employees only two weeks to consider options, the company decided to make a complete 180-degree pivot when it ran with the idea of a status-updating micro-blogging platform conceived by Jack Dorsey, Biz Stone, and Noah Glass. [iv] The rest is history. Doing nothing is riskier than pursuing innovation. Consider this question: will your firm’s current strategy provide it with the desired growth in increasingly competitive environments? The value of innovation should be measured ultimately in a firm’s market capitalization, as an appropriately executed innovation platform will increase the top line and have a view for efficiency with respect to the bottom line. This combination of increased revenues and net income combined with enhanced efficiencies and continuous improvement is undeniable. Yet, when evaluating innovation opportunities, organizations use an array of proven tools such as NPV, IRR, and EPS to name a few, which may not be the appropriate yardstick for transformative concepts and ideas, and elements of these tools may not adequately quantify and assess. In a time when businesses must permanently accelerate, their strategic architecture is actually slowing them down. Given that there is a tradeoff between strategic agility and the amount of control and risk an organization desires, we would go as far as to say that although historically justified, such mind sets are becoming increasingly dangerous. Executives have a significant in­­flu­­­­ence on the firm’s orientation towards in­­no­va­tion, and any new approaches have to be borne in the C-suite. The firm’s ability to create the greatest shareholder value at the most acceptable level of risk will be facilitated through the alignment of strategy and innovation. This shift in thinking and approach will prove to be the greatest challenge to leaders, and those who achieve this alignment will lead their industry. Yet, it is safe to say that many organizations do not have an innovation approach. Victor Assad is the CEO of Victor Assad Strategic Human Resources Consulting and is a Managing Partner of InnovationOne with C. Brooke Dobni, PhD. and Ed Colby. For more on strategy shift and cultures of innovation, please download “Strategy Shift” https://doi.org/10.1016/j.bushor.2018.06.002. or email us at innovate@innovationone.io or call 707-331-6740. [i] Gilbert, J.T. (1994). 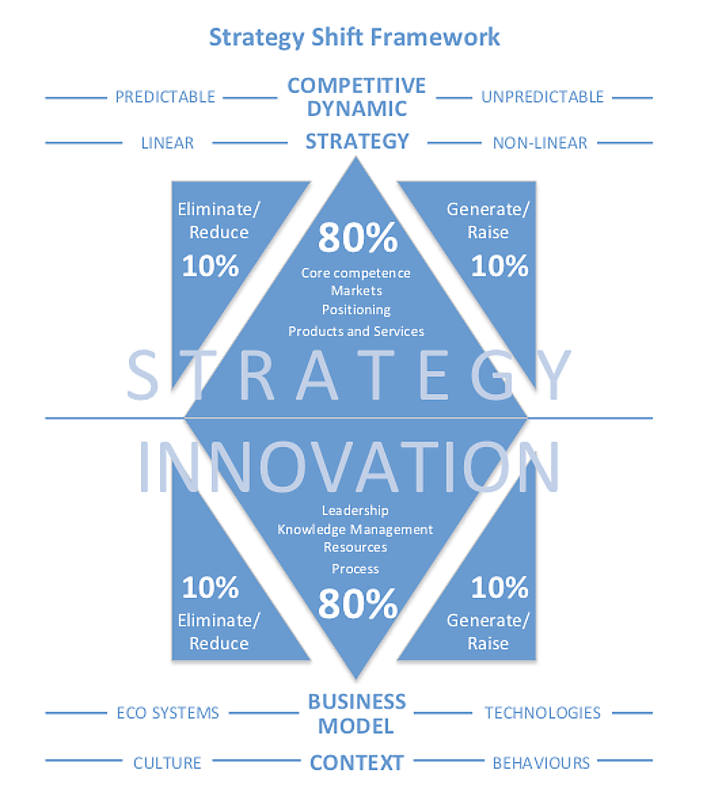 “Choosing an innovation strategy: Theory and practice,” Business Horizons, 37(6), 16-22. [ii] Reeves, M., Moose, S. & Thijs, V. (2014, June 4). “BCG classics revisited: The growth share matrix,” Available at https://www.bcg.com/en-us/publications/2014/growth-share-matrix-bcg-classics-revisited.aspx. [iii] C. Brooke Dobni, PhD, and W. Thomas Nelson, Jr. PhD. (2013) “Innovation Nation? Innovation Health Inside the Fortune 1000,” Found at http://innovationone.io/research/. And Victor Assad; C. Brooke Dobni, PhD; Ed Colby; and Ataman Ozyildirim, PhD, (2017) “Insights from Highly Innovative Companies: Results from The Conference Board and InnovationOne Global State of Innovation Survey 2017” RESEARCH REPORT R-1648. Available at http://innovationone.io/research/. [iv] Christian Wolan, (April 14, 2011) 01:53 PM) “The Real Story of Twitter,” Forbes. Found at https://www.forbes.com/sites/christianwolan/2011/04/14/the-real-story-of-twitter/#8f67fd266af8.